You are currently browsing the tag archive for the ‘ploughmans’ tag. Virtual pickled onions. Oh yes. A key part of a ‘ploughman’s 2012’ concept for allium’s tasting room. The fallout from Ferran and Albert Adria’s work has been interesting to watch. Most visibly, foams have been deployed every which way, roundly slated, and then pretty much withdrawn again. It’s a shame so many tasteless aerated sauces have been draped on plates without care, because when used correctly, foams can offer a pretty terrific way to deliver flavour and texture. Spherification hasn’t been co-opted quite so much, but its uses have often been even more criminal. Again, too many chefs think that randomly dropping a sphere onto their plate will instantly make the dish so much cooler (just as they now do with foraged items), without ever considering what role the sphere plays on the dish or how the diner is going to relate to it. The Adrias’ have used spherification in a number of smart ways, but their stroke of genius was to use the technique to serve a virtual olive. In the jar it looks like an olive. In the mouth it tastes like an olive. It’s true to their terroir. It’s clever AND tasty. Here’s my own little adaptation of that concept, the aim being to throw in my own cultural reference points, while paying just as much mind to the way the diner will interact with and react to it. 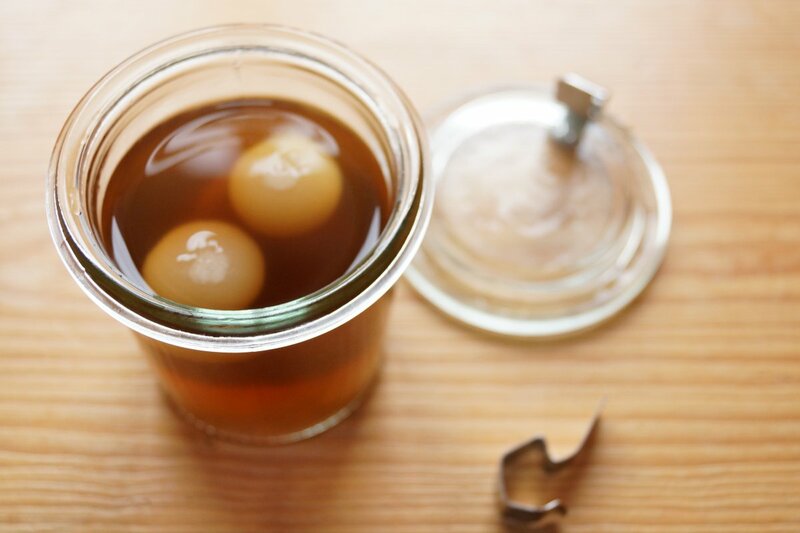 In the jar of pickling vinegar they look the part, and in the mouth they perfectly match the real thing. And crucially, the pickled onion is something that translates to the new medium. The sphere’s skin has a texture akin to that of a real onion, so the diner feels comfortable with the texture (quite literally a sticking point with so many misconceived spheres). Truth be told I could eat these all day.